Accounting Standards Codification 350 (ASC 350) defines the testing for goodwill impairment. In the impairment test, which should be performed at least annually and potentially in interim periods if there is a triggering event, the fair value of the reporting unit is compared with the carrying amount. Traditionally, testing for goodwill impairment was a two-step process. Under Step 1, if the fair value of the reporting unit is greater than the carrying amount, there is no impairment and further action is unnecessary. If, however, the fair value is less than the carrying amount, goodwill may be impaired. Under current FASB guidance, a Step 2 analysis is performed to determine the fair value of goodwill and hence the level of goodwill impairment. Step 2 is similar to a purchase price allocation where the fair value of goodwill is determined based on the value of the reporting unit less the fair value of reporting unit’s assets and liabilities. STEP 1. Instead of performing a calculation of the fair value of a reporting unit, under ASC 350 companies may perform a qualitative assessment to determine whether it is more likely than not that the carrying amount is less than the fair value. STEP 2. Instead of completing a Step 2 calculation, under ASU 2017-04 companies may elect to apply a simplified approach to determine the level of goodwill impairment. Under this approach, the level of goodwill impairment is the amount by which the carrying amount of the reporting unit exceeds its fair value. It is important for companies to understand that the impairment amount between the Step 2 approach and the simplified approach may differ materially. VRC has extensive experience with valuations of both reporting units and their assets for goodwill impairment testing purposes. Just released! 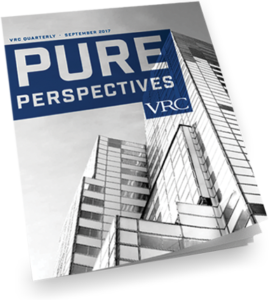 Read VRC’s Industry Update on Building Material Distribution for relevant market data, trends in industry EBITDA multiples, notable M&A deals and more.